I really hope that through Professor Chen’s vision, readers will seek the right future path to true blessings, which I think is actually not far from us. --- Dr. James Chen, Everlight Chemical Industrial Co., Ltd. The next hundred years will be probably the worst or best time of human civilization. In the next hundred years, the application of extreme concepts may lead to catastrophe of civilization: scientism, capitalism, religious belief, consumerism or nationalism, in tandem with technology abuse. In fact, incidents that happened after 2000—the 911 attacks in New York, November 2015 Paris attacks (and of course other terrorist attacks) and ethnic and religious persecutions—may have appeared to support what Pope Francis referred to as “A Piecemeal World War III” on the World Day of Peace in 2016. Nearly three thousand years ago, Socrates regarded himself a citizen of the world, saying “I am not the Athenians, nor the Greeks, but citizens of the world.” Figures throughout human history all called on people to have merciful love: from Jesus, Confucius, Laozi, Gandhi, Dr. Martin Luther King to Malala. This book excerpts some of their well-known speeches to share their global mind for all global citizens and to let us contemplate on our mission and potential attainment in this very era. Let us follow their path to prove that human civilization can be the best existence of the universe. Lastly, I would like to express my sincerest gratitude to a number of seniors and friends who recommend the book, and the above short poem “the Global Warm Heart” is dedicated to them and all the readers. It is a state of eternity transcending Millennium. It is a heart-to-heart experience beyond borders. It is something advanced and beyond comparison. It is a firm belief to heart. It is a true feeling that you want to contact anytime. It is a connection, so you can trust. It is a kind of beauty that makes you pamper and crave. 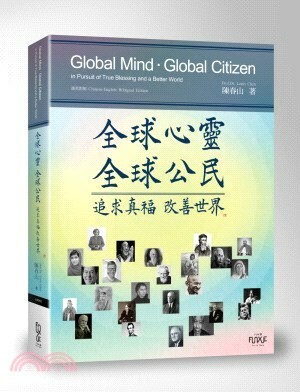 It is a mind, a heart-warming global mind. It is an idea to warm our world.